I had several batches of maple bacon sugar cookie dip ready to go since I tested it several times as I do with most recipes. So I shared the dip with my family and friends and do you know what they said to me? At first glance, this dip looks like baked beans. They’re right. Don’t you think? Let me tell you though, this dip is so much better than baked beans. The Smithfield Bacon gives it so much flavor. 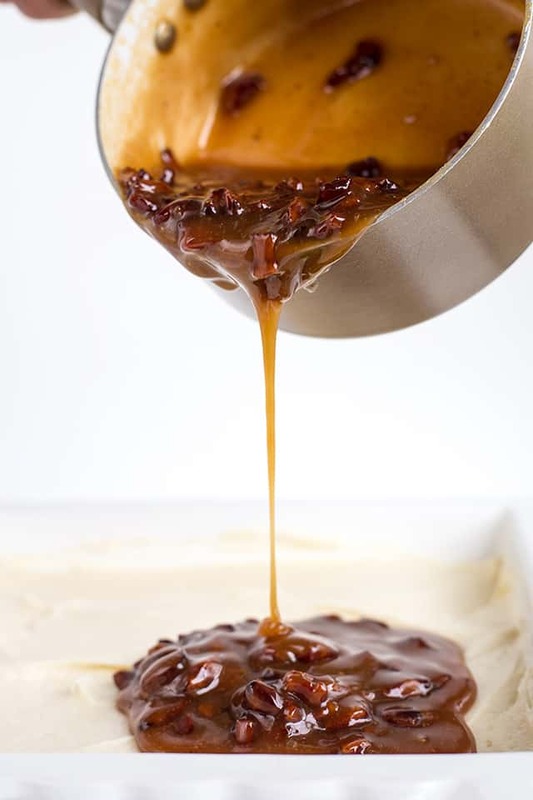 It takes the maple bacon caramel from being overly sweet to the perfect balance of sweet and salty. There’s no doubt that bacon makes everything better and nothing is better than Smithfield’s slow-smoked and cured bacon. 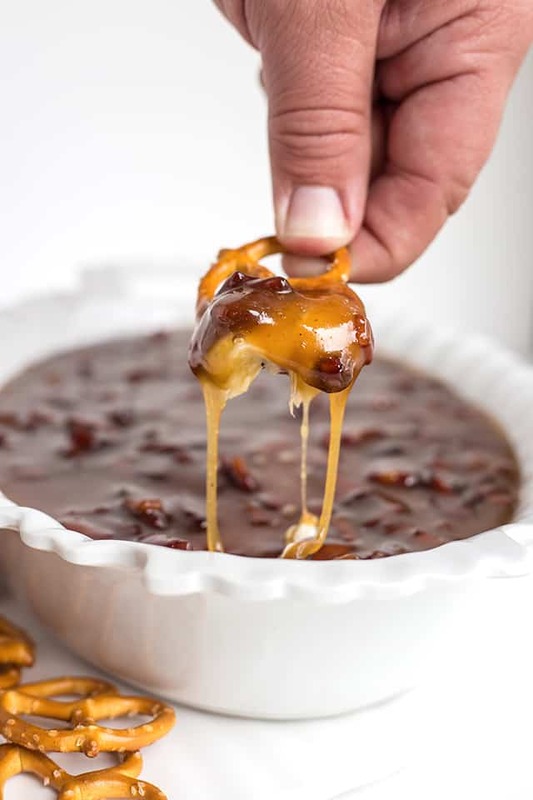 I’m calling it a caramel because it’s gooey and sticky. It doesn’t harden up so you can keep dipping all day long. You know, this would be the perfect game day dip! It takes about 30 minutes to whip up and can feed a whole party of bacon lovers. Speaking of bacon lovers, now through the end of December you can be entered into the Bacon for Life sweepstakes for the chance to win Bacon for Life! That’s enough bacon for you and your friends! Think about it, bacon cheeseburgers, bacon pancakes, bacon s’mores, bacon-wrapped anything… bacon-wrapped everything… for life. Just look for specially marked packages of Smithfield Bacon at your local grocery store and visit smithfield.com/BaconforLife to enter for the chance to win. 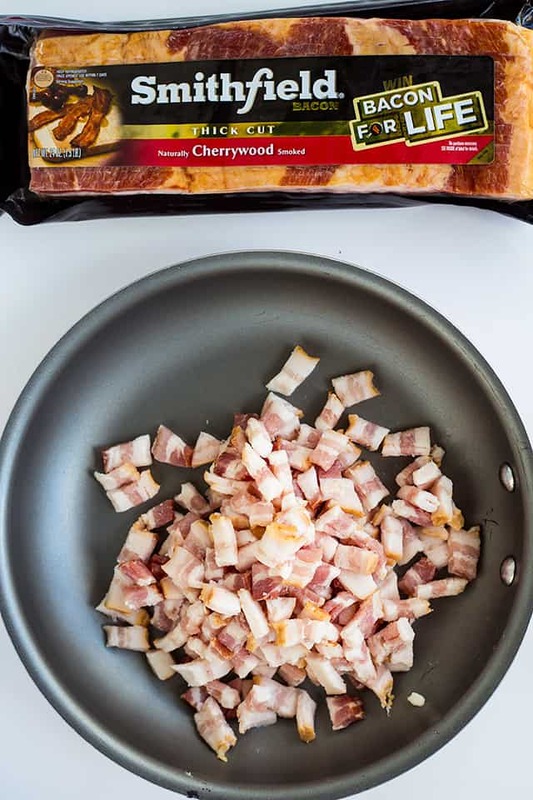 To start making the maple bacon caramel, grab Smithfield bacon, I chose the Smithfield Cherrywood Stack Pack Bacon because the bite-sized pieces of this thick cut bacon would be a little more substantial. You want to know that it’s chunks of bacon you’re eating right? Chop the bacon into small pieces. The easiest way for me to chop bacon is with a pair of freshly-washed scissors. I snip the bacon down the center and then across. Cook that up and scoop the bits onto a paper towel lined plate. It shouldn’t take more than 10 minutes to cook the bacon. 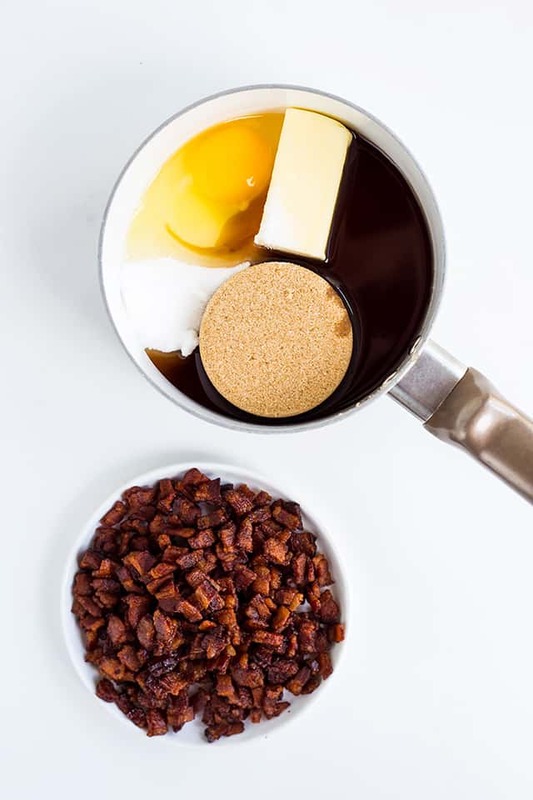 While the bacon is cooling, add the butter, sugars, maple syrup, and egg into a medium saucepan. Let it come up to a boil and boil for 6 to 8 minutes while stirring constantly. Let it cool for about 3 minutes. Then add in maple extract and bacon. That part is ready! I love to prepare the sugar cookie portion while the bacon is cooking. It doesn’t take long to whip up and there are just a few ingredients. In a mixing bowl, add in the cream cheese, sugar cookie mix, powdered sugar, and heavy cream. If you can find sugar cookie coffee creamer in the stores, use that instead of the powdered sugar and heavy cream. It’s absolutely perfect for this recipe. Mix it up with a hand mixer until it’s all combined. In a shallow serving dish, something comparable to a 7×11 pan spread the sugar cookie dip out. 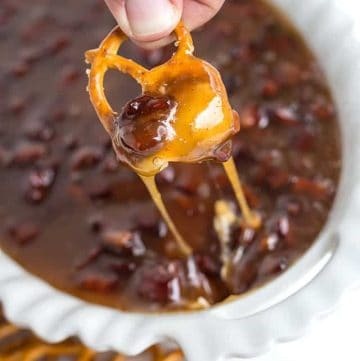 Pour the maple bacon caramel on top. Be sure to pour it all over the top and not just in one place so it isn’t hard to spread it out. You don’t want to disturb the sugar cookie layer, right? Finally, grab some pretzels and dig in! 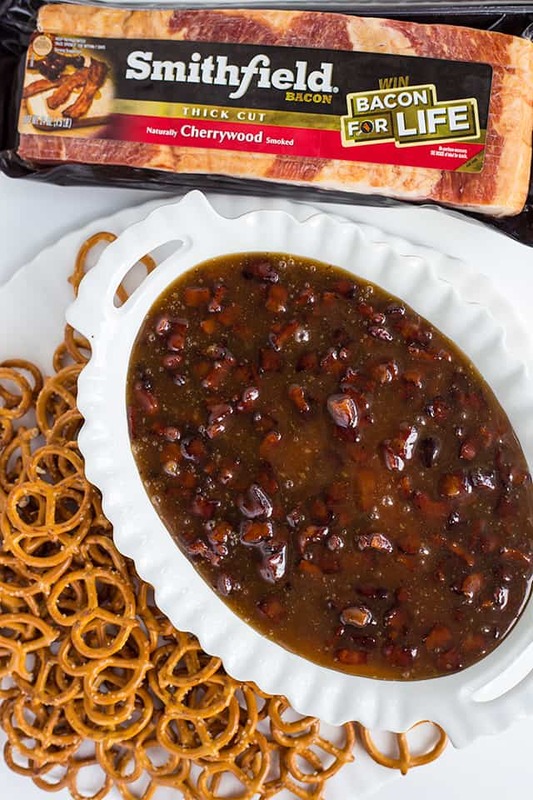 Let’s chat a little more about this bacon for life sweepstakes with Smithfield Bacon. From September 1 through December 31, bacon lovers everywhere can look for specially marked packages of Smithfield bacon in stores or visit baconforlife.com to enter. To enter, buy the specially marked packages of Smithfield Bacon and enter the unique code found inside the package at baconforlife.com. 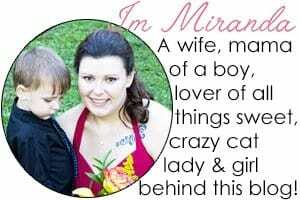 Follow the prompts to be entered. Using a pair of clean scissors or knife, cut the 8 pieces of bacon down the center of the strips of bacon and then across the strips into a large frypan. Place over medium heat and cook until the bacon becomes golden brown but still chewy. Scoop the pieces of bacon out with a slotted spoon onto a paper towel lined plate. In a medium saucepan, add in the butter, both brown and granulated sugar, maple syrup, and egg. Stir to combine. Place over medium heat and let it come up to a boil. Boil for 6 minutes while stirring constantly. It will bubble up and look somewhat foamy and then eventually go back down. Remove from the heat and let cool for about 3 minutes. Add in the bacon and maple extract and stir until incorporated. 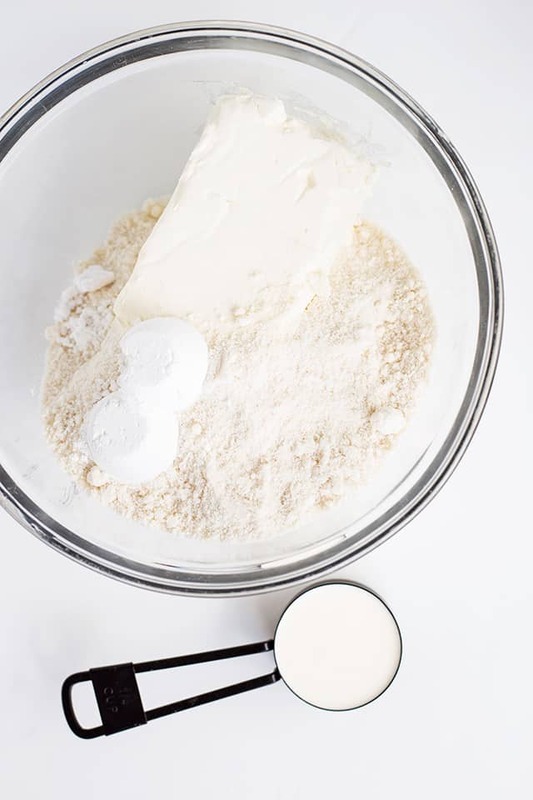 Add in the dry sugar cookie mix, cream cheese, heavy cream, and powdered sugar into a mixing bowl. Beat on medium until incorporated. Spread the sugar cookie dip into a shallow dish. (Something similar to a 7x11 dish.) Be sure to get the dip to all of the edges and corners. 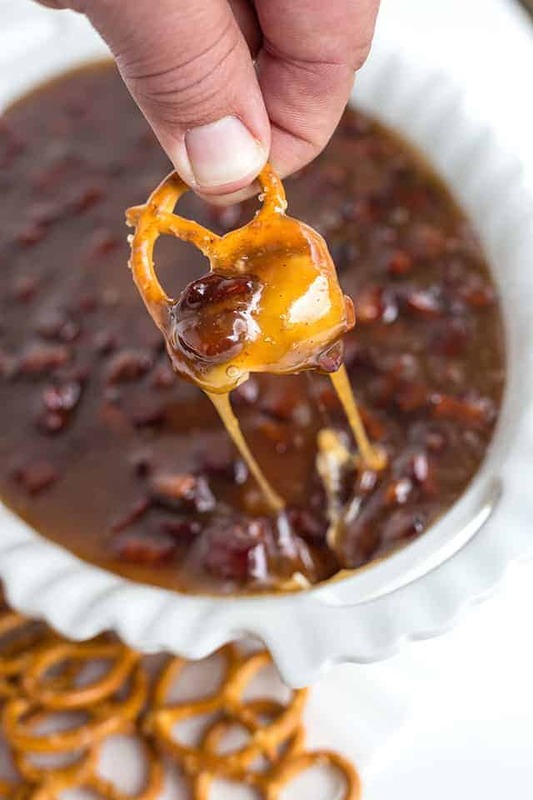 Drizzle the maple bacon caramel on top of the dip. 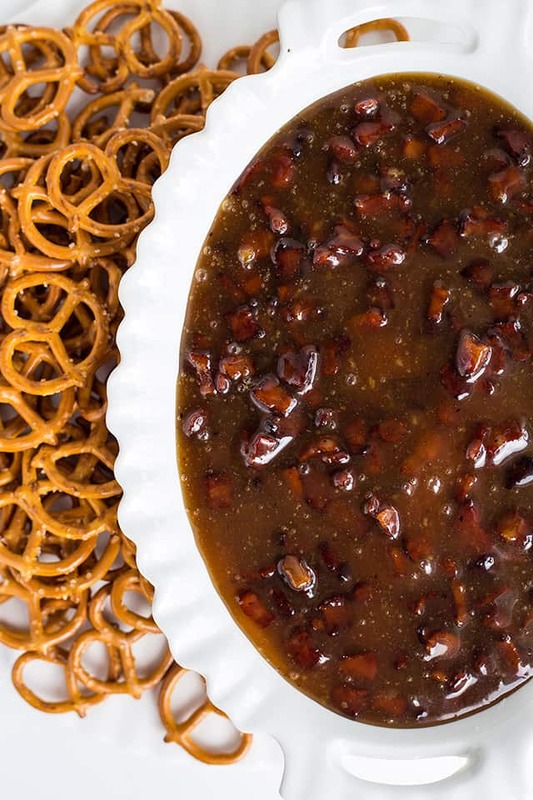 Be sure to drizzle it all over to help it cover all of the dip without having to spread it. If you can find sugar cookie coffee cream, substitute that for the heavy cream and powdered sugar. It's perfect for this dip! This is a sponsored post written by me on behalf of Smithfield Bacon. Oh my goodness this is the ultimate pretzel! I am so excited to give these a try!